Wales manager Chris Coleman believes a ground-breaking new grassroots football initiative provides a "unique opportunity" to boost the game in Wales as Euro 2016 approaches. With excitement building ahead of Wales' first appearance at a major football finals since 1958, the Football Association of Wales (FAW) have launched a new scheme to get 30,000 more kids playing football in the next three years, whilst also developing the next generation of coaches. The Lidl Play More Football scheme is a joint initiative between the FAW, the Welsh Football Trust (WFT) and the supermarket chain - the lead grassroots football partner for the home nations - that will give children an increased role in planning and running coaching sessions with their peers. 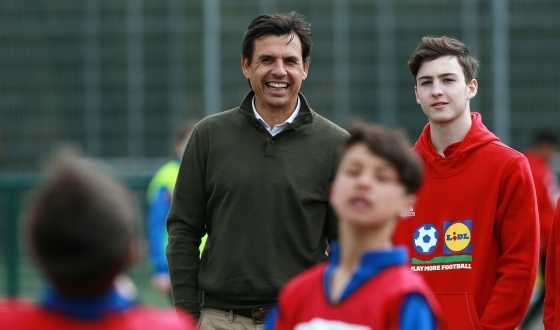 National team manager Coleman, who was at Dragon Park in Newport this week to launch the programme, believes the timing couldn't be better to try and develop the grassroots game in Wales. “Interest in the Wales national team is higher than ever thanks to our qualification for Euro 2016, so it’s fantastic that we have recognised the unique opportunity we have to grow football in Wales," said Coleman. "The Lidl Play More Football programme can capitalise on our nation’s excitement to engage more young people to participate in football, through both leading sessions and playing. The new scheme will provide prospective young coaches with the skills to plan, organise and deliver inclusive, fun and easy-to-play football activities to engage their peers who do not currently play the game, whilst placing an increased focus on encouraging more young girls to participate in the sport. The peer-led weekly secondary school sessions will introduce 10,000 new young players to the game, coached by 1,000 young Directors of Football, who will be trained and equipped to run football activities in their schools. Supported by teacher mentors, the Directors of Football will be able to develop their leadership skills, grow in confidence and apply learnings to other areas of their lives. Weekly primary school sessions, set to launch in September 2016, will engage a further 20,000 children to get active, learn new skills and enjoy the game. According to the Sport Wales School Sport Survey, over 67,000* young people in Wales currently participate in football, but the FAW and WFT want to increase this figure to 200,000 by 2024. 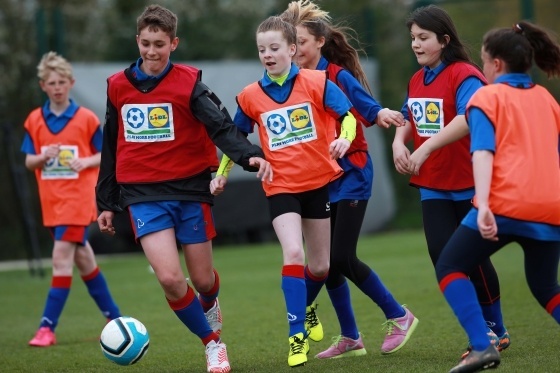 Jonathan Ford, CEO of the Football Association of Wales, said: “This initiative will encourage participation of young people who do not currently play the game and will also develop a new generation of young coaches and leaders in Wales. To find out more about Play More Football, including details of how to register for the programme, visit welshfootballtrust.org.uk/LidlPlayMore, whilst you can also take a look at the video below.